I’m so excited to finally share some photos of our house! 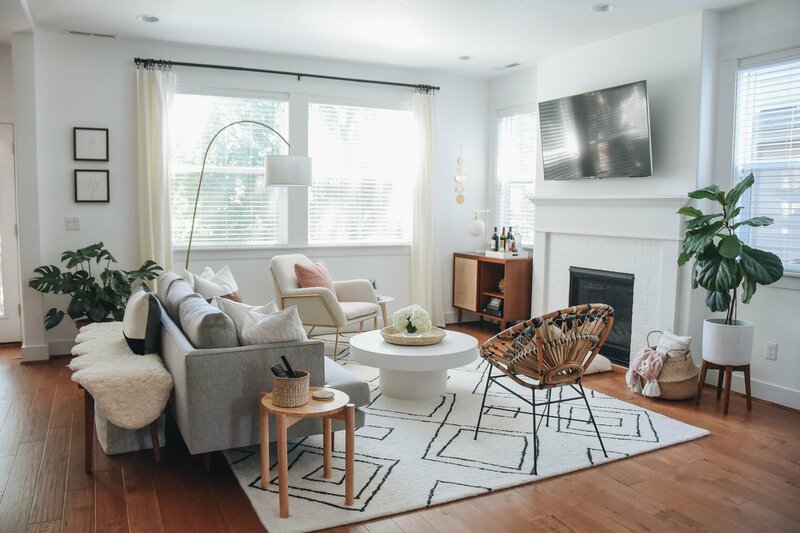 It’s been a process and we still have a ways to go, but our living room is nearly finished and I figured, it’s about time I share a little something with you. Going into decorating this house, I knew it would be a lot, but I didn’t realize what a process it would be. Deciding on pieces without knowing if it will work with other pieces, backordered items, receiving wrong items, I mean the list goes on and on. I can’t even tell you how many rugs we’ve had to return. The good news, I feel like we’re coming out on the other side and things are starting to come together. 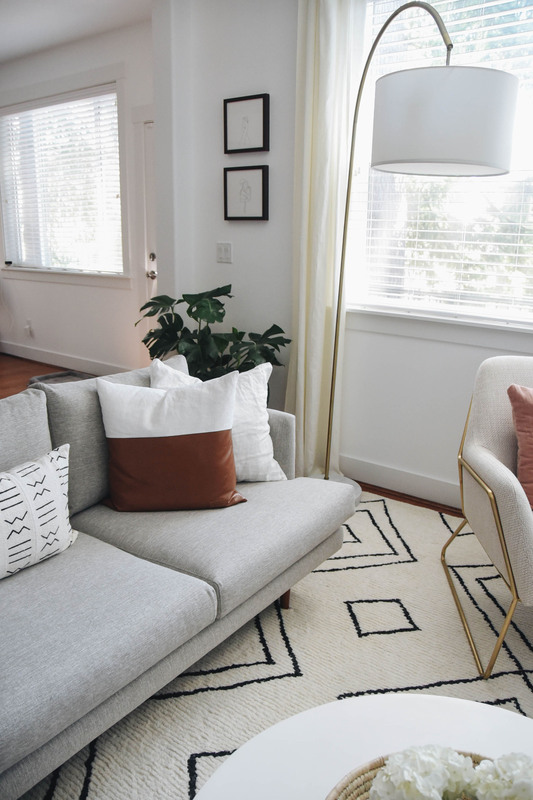 The living room is probably the most finished space and we have Article to thank. One of the things I was most excited about with the purchase of our home was partnering with brands that we truly loved in order to bring our vision to life. I found Article on Instagram and instantly fell in love with their modern mid-century and scandinavian furniture. 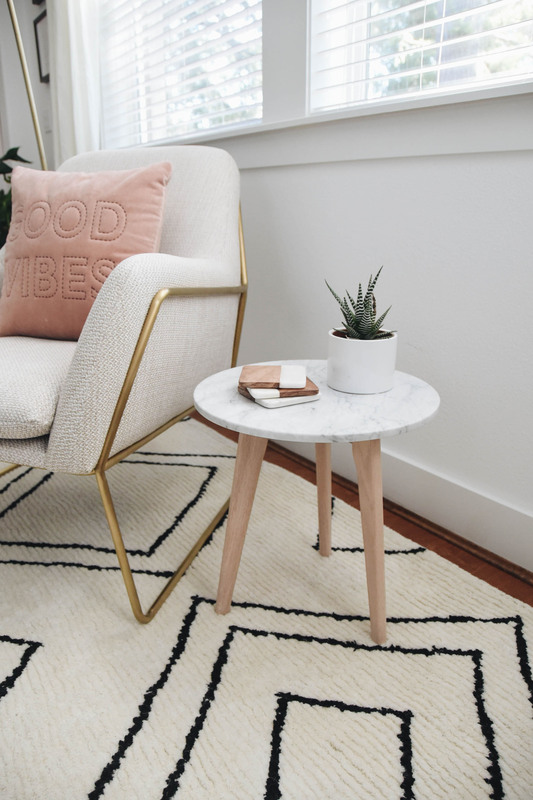 I actually found the Burrard couch on a home decor Instagram account and went down the rabbit hole of social media and ended up on Article’s website. If you don’t know about Article, I highly recommend checking them out. Their pieces are gorgeous and at a really great price points. One of my favorite pieces is the Burrard couch in sea salt gray. I’ve been wanting a gray couch for a while and when I spotted this one, I knew it would be the perfect foundation piece for our living room. I love the clean lines and simple yet elevated design. I haven’t tested a ton of couches out, but it does seem like it’s on the small side. Our previous couch was quite large, so this one took some getting used to. I also think this is the style now. With all the home purchases we’ve done recently, I noticed everything we gravitate toward is short and small. It took some adjusting to, but it actually worked out perfectly. Mike and I both think it helps the room look bigger. One of my favorite things about this couch, it doesn’t lose its shape. With dogs and an OCD husband, this was huge for us. We’re not constantly fixing the cushions, which has been a nice change. 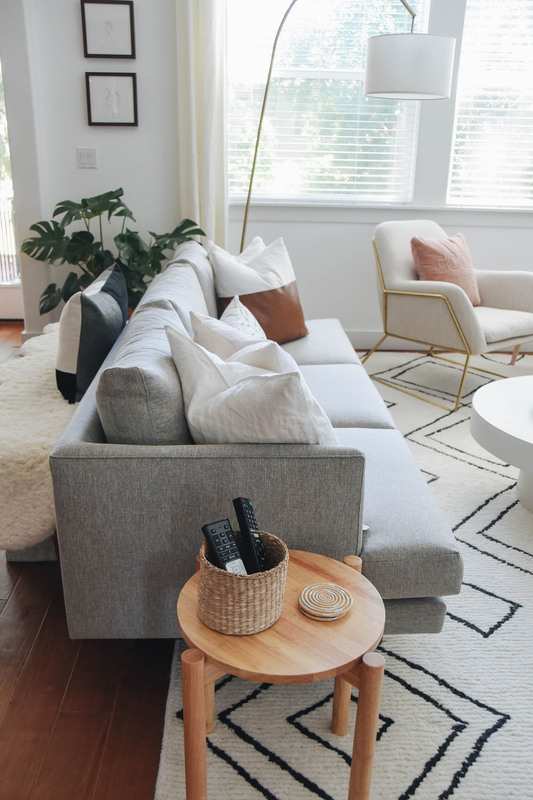 We wanted extra seating in the living room and the Forma chair in milkway ivory is the perfect addition. The curved metal is such a unique touch and it’s honestly beautiful in person. It’s comfortable without losing its shape and the color is versatile. Lately, it’s been the most popular seat in the house – although Riley and Lola have been hogging it. When I spotted the Daisy lounge chair I thought of a million ways we could use it in our house. 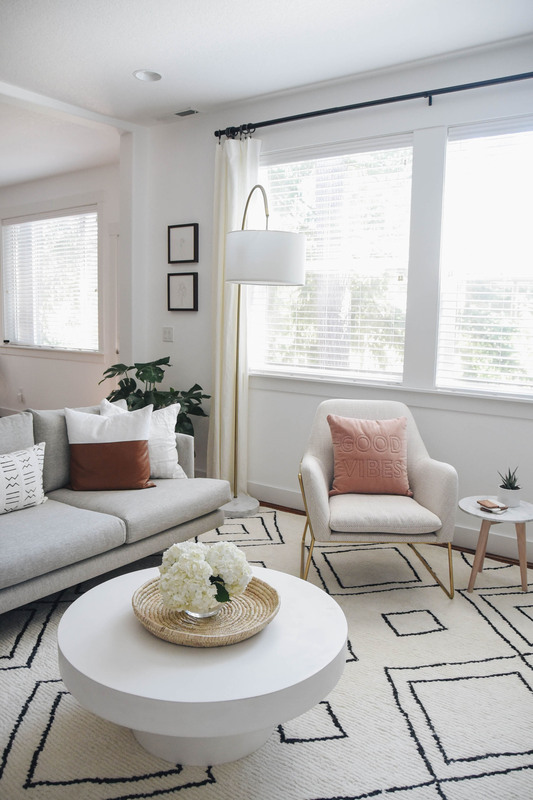 Right now it brings a pop of texture and boho vibe to our living room, but I can already see it working in our master bedroom and deck outside. 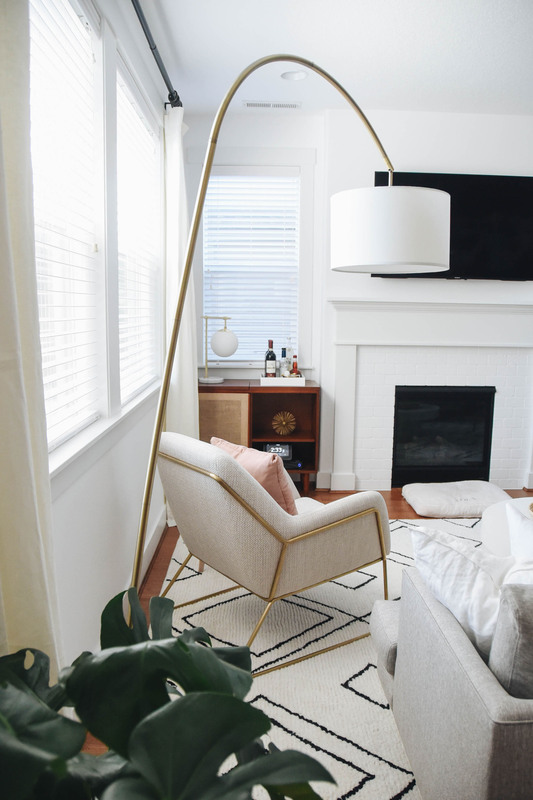 Just like I do with my clothes, I gravitate toward pieces that are versatile and can work in multiple spaces and the Daisy lounge chair does just that. An added bonus – it’s weather-resistant, so for those of you looking to redo your backyards, this is a great option! The Mara side table was a pleasant surprise. I initially thought it was very tiny (only 15.5” in height), but it’s proven to be really versatile (works perfectly has a plant stand as well). 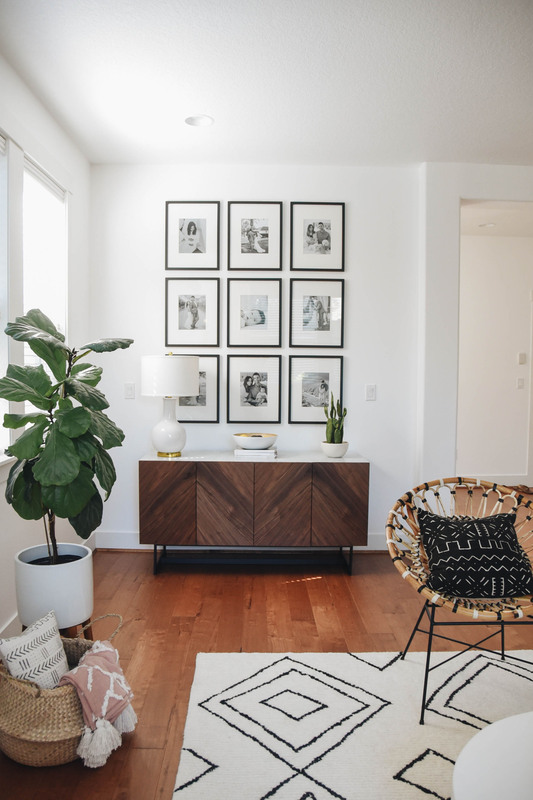 With the solid wood legs and marble slab, you’re getting that classic modern mid-century look, which works in so many spaces. I think I may need to order one for Harper’s nursery and my office. How many of the same thing can you have in your house, lol? Alright, one room down, and 6-7 more to go, ha! I have to keep reminding myself, decorating a home is a slow process. Take your time and enjoy it. I’ll be sharing more details and room soon, so stay tuned! Special thank you to Article for partnering on this post. OMG your space is to die for! In LOVE! 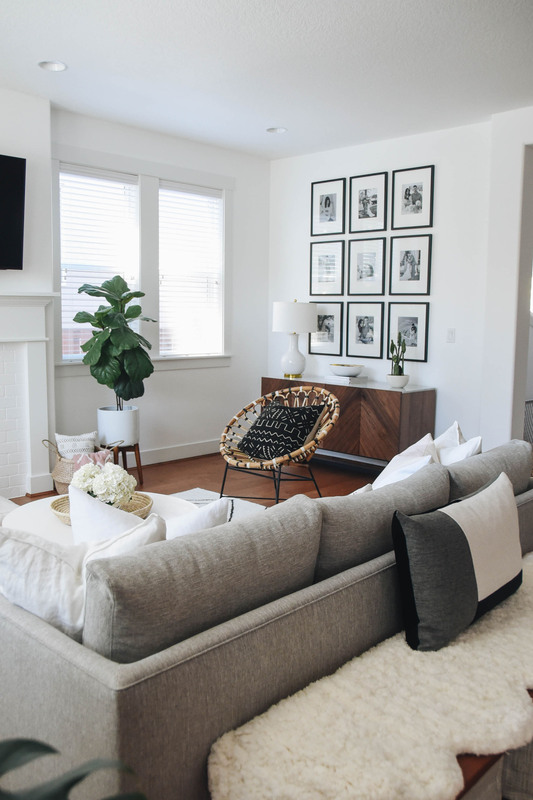 Love love love your living room! I always admired your home decor style! I really should check out Article! Modern mid-century and Scandinavian pieces are my favorite! Love the look of your living room! Where is the gorgeous from? What kind of plant is that? So cute! Thanks in advance! Your home looks lovely! I love the way you’ve put this room together. 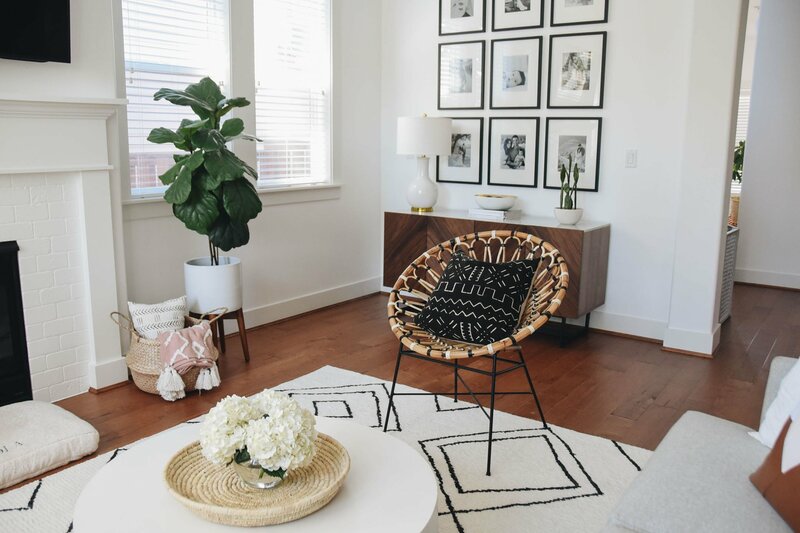 Where is the little wooden side table from? Ahhh, using this as my inspiration to decorate our living room (even though it’s a completely different color scheme). We were looking at Article too! Where is the gold hanging wall decor in the bar from? 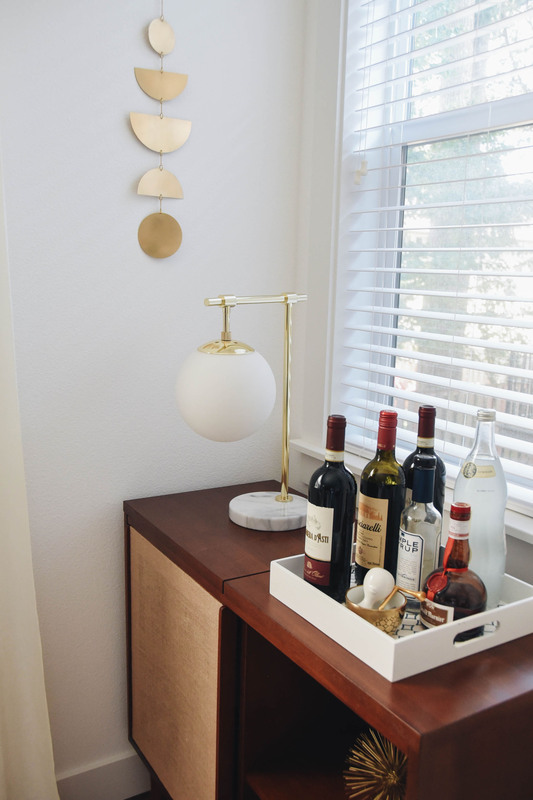 Love this chevron side board. Where did you find that piece? Your living room is my dream living room! I love everything from the couch to the basket for remote controls! Thanks for sharing as this will be my future home inspiration! I love your living room. I am trying to decorate my new home too. 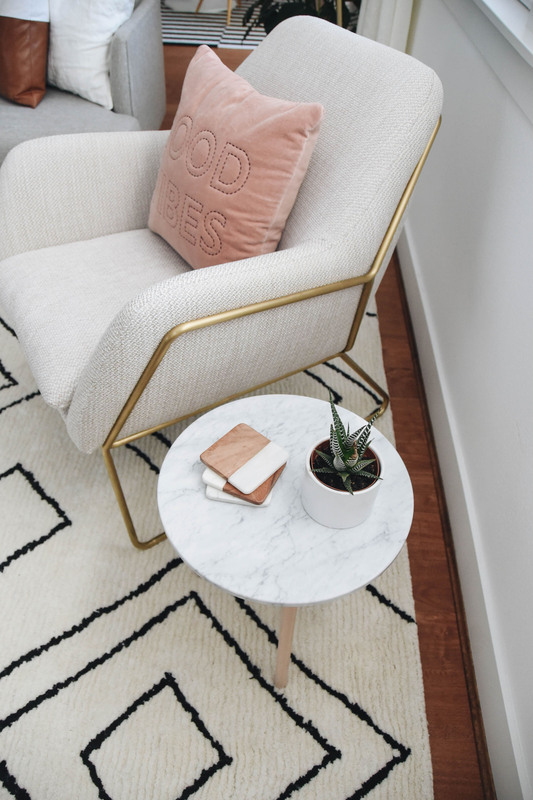 Where are your coffee table and rug from? I am looking for a console like the one you have featured under the beautiful display of framed photos. Can I ask where you got it/brand?